#959 A letter is better than SNS!? My friend, T lives in Hawaii, after she married to an American. We are friends from junior high school. 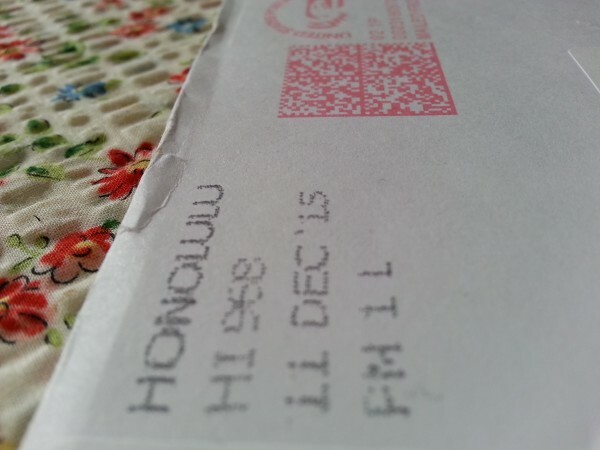 We know each other’s address and e-mail but we don’t contact often except exchanging X’mas cards. I have been wanting to connect with her through facebook for a long time. I sent messages a few times, but she didn’t reply. Maybe she didn’t notice them. Because she was blocking friend requests from others. Therefore we couldn’t connect on facebook. A letter is better than SNS!? Last Christmas, I got her X’mas card. In return, I sent a Nenga-jou(a New Year card) to her. I told her about approving my friend request on facebook. After the New Year, I got a message from her on facebook. Finally, we become friends! It took so long to connect with friends on facebook. I found that facebook is very convenient, useful and quick, but sometimes when facebook doesn’t work, we could still contact with each other using a more primitive way, a simple hand-written letter. It’s a happy thing if you can connect to your old friends who you haven’t met for a long time.